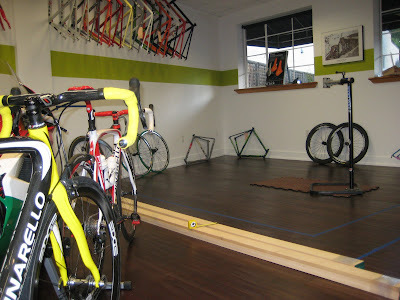 If any of you have been in the shop over the past two weeks, you’ve no doubt noticed that we’ve got a large corner carved up for our new service center. After a couple of years out in the garage, we began to suspect that Chris was suffering from LMS or Lonely Mechanics Syndrome. Yes, it’s true. So, as the days grow shorter and darker, we’re making the move to bring the bulk of the AC service center into a clean, well lit place. 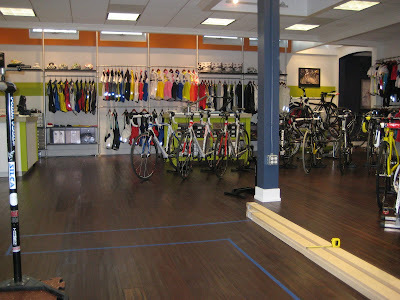 As the shop is something less than the 30,000 square-foot bicycle super store a few miles north of our humble spot in Mill Valley, putting a service center in meant a very serious rearranging of just about everything in the shop. 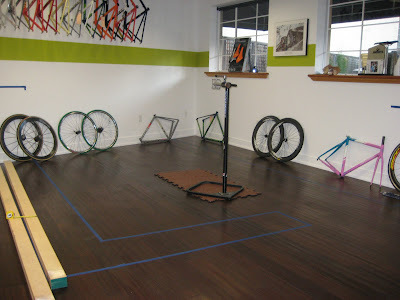 In order to carve out the roughly 10 x 12-foot space that Chris will now call home, we moved bikes, wheels, couches, televisions and anything else that stood in the way of progress. What does it all mean for you, our customers? Beyond seeing Chris without having to walk out back to the garage, you’ll have the luxury of sitting at a new counter that we’re going to install around the service center. You’ll be able to watch videos and maybe someday drink an espresso. What’s more, we’ll be updating the menu of services that we offer to include some high performance tunes and maybe even an annual service plan for those of you that we see most often. The current plan is to have things in working order by November 1st. Based on where we’re at today, it feels pretty realistic that we’ll hit that. Stay tuned for more info next week.